Twice a year, the Federal Reserve Chairman gives a report to, first, the House Banking Committee and, then usually the next day, to the Senate Banking Committee. This testimony was started during the Carter-era as part of the Humphrey-Hawkins Full Employment and Balanced Growth Act of 1978. It continues twice a year, two days in February and again two days in July. These are low-probability days to trade as the market jumps every time Bernanke says one thing and, then another. My advice is that these four Humphrey-Hawkins days are good days to take off from trading guilt-free. 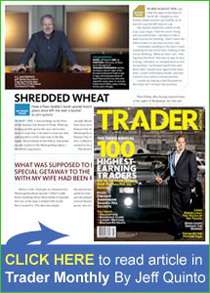 Why do the same people consistently win at futures trading and how can you become one of them? Why should you have a written trading plan? Regardless of what you have attempted to do in the past, trading is likely to be the hardest thing you will ever do.It, also, has the potential to be the most joyous and rewarding thing you will ever do. The fact is that trading is hard because it forces you to face your every weakness. Your slightest negative emotion can be magnified until you are overcome with disappointment and self-doubt.